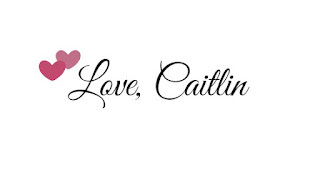 If you are a frequent reader of my blog then you will know that I feature and review a lot of Makeup Revolution products and I decided that I would try and get a better balance of brands. However, I found this amazing little palette in Superdrug a few weeks ago and I had to try it out. I also seen Tati from GlamLifeGuru mention this on her YouTube channel and she loves it too. 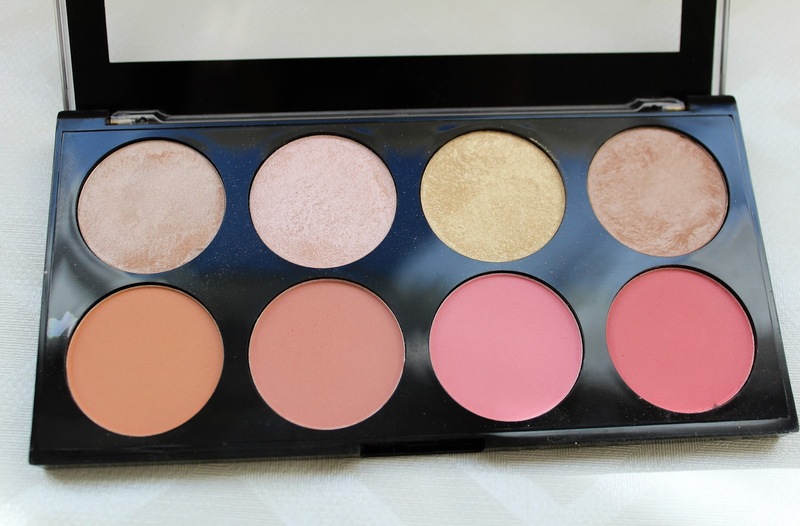 Makeup Revolution say “Introducing our stunning blush and highlight palette, Blush Goddess! 4 beautiful highlighter shades, ranging in intensity from natural sheen to intense illumination. 4 blushes from pink to peach, a great all in one palette for every day blush and highlight. Highly pigmented, smooth and blendable shades. Sweep highlight shades along cheekbones and an upward stroke of blush shades starting from the apples of the cheeks.” So let's jump on into the review and hear what I think about this gorgeous palette. 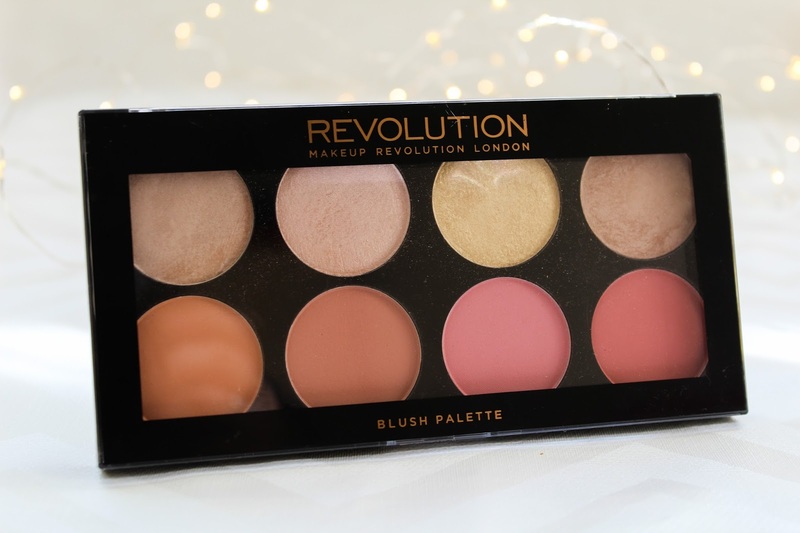 Everyone knows that Makeup Revolution are releasing new things constantly (no complaints here) and recently they launched a range of new blush palettes which I just had to go pick one up. I feel like Makeup Revolution do blushes perfectly and I was really intrigued by the Blush Goddess Palette as it contained not only blushes but also highlighters too. Honestly, I am not someone who used to give too much thought to blusher, I always had one from Rimmel that I always used but when that started to run out I knew I had to pick another one up. I feel like my face always need a pop of colour on my cheeks because of how pale I am and I need to look like I'm alive haha! So, when Makeup Revolution dropped 3 new blush palettes in one day, I just knew I had to get one and try them out. After looking at YouTube videos on line and seeing Tati show this one and how much she loves it, I knew that it would be a good one for me as the colours looked brilliant for my skin tone. The highlight shades also won me over just a little bit too. Starting with the packaging, I have to admit that I do like the clear see through lid packaging as the other blush palettes I have seen from them had a gloosy black casing which would be annoying as you wouldn't be able to see what was inside and if it was the palette you wanted to use, especially if you owned more than one. I like that clear lid makes it easy to see the colours inside the palette, especially instore when you are deciding which one you want to purchase. I know some people will not like this packaging, they might think it is a little cheap looking or aren't happy that they now don't have a mirror inside either but I have never used a mirror in the palettes before anyway so it doesn't really bother me that much. The palette contains eight circular pans of powder blushes and highlighters, they do say that they are all blushes but that definitely isn't the case for the first row as you can clearly see that they are highlighters. I personally love these palettes as I like that I can use my brush and mix the shades to make a custom shade if I really want to. The palette overall is lightweight and slime so it doesn't take up a lot of room on my dressing table or even in my makeup bag when travelling. As I mentioned before, the first row are all highlighters instead of blushes but you could use them as a blush topper if you really wanted to. 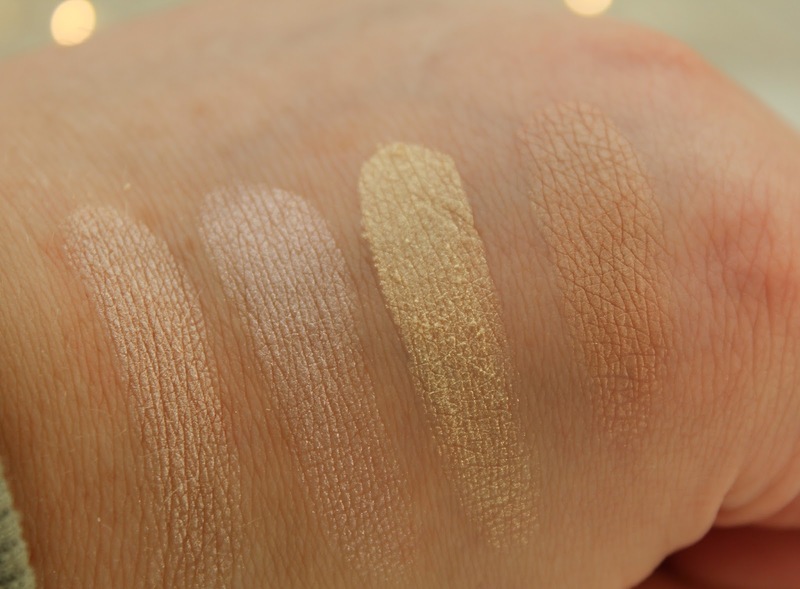 The first shade looks like a beige shade in the palette but when you swatch it or apply it to your skin it comes out more of a peachy pink shade with a silver sheen shimmer in it which does look nice on my skin as I am pale and it's a gorgeous shade for me. The second shade is slightly more cooler in tone than the first one and it is a lot less in your face and glittery than the first. It is more finely milled so it looks more like a subtle glow than a serious highlight. The third shade looks very intimidating, even in the palette. When you swatch it, it looks like a buttery yellow gold shade. This one is very pigmented and you do not need a lot of this at all, I did at first and then looked slightly ridiculous with a very intense highligh. It can be worn quite sheerly if you use only a little and tap off the excess but you can build it up if you prefer a more glowy or intense highlight. The fourth and final highlight shade on the top rown is quite unique compared to the other ones as it doesn't contain any shimmer at all, instead it is more of a satin highlight. It has a orangey peach tone to it with a beige tint so it could perhaps be a light bronzer shade but it does make a gorgeous and subtle highlight on my skin tone. Onto the blush shades, as a whole they are pretty smooth and creamy just like the highlighters, they are not chalky or hard to blend at all. 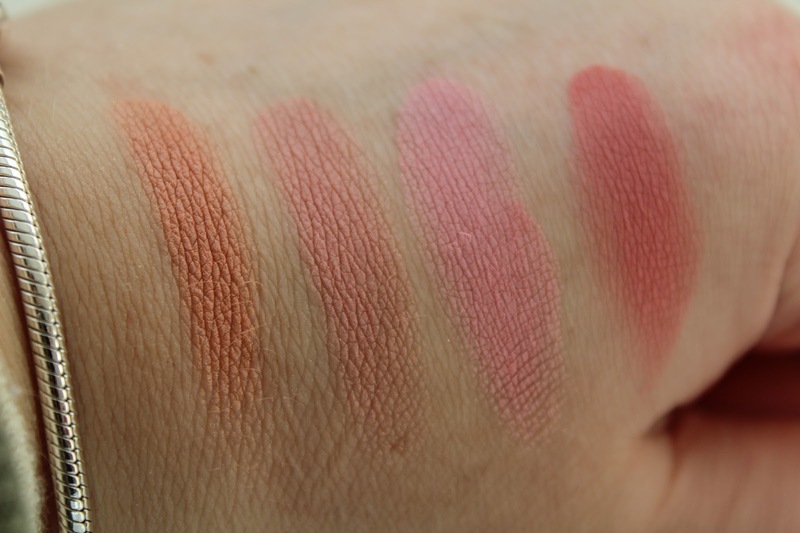 The first shade on the bottom row is a peachy coral shade which is really pigmented and so easy to blend out. This shade would suit so many skin tones as it is so gorgeous. The second shade is my favourite one of the four, it is a mauvey pink shade with a little brown undertone that compliments any makeup look that you do, it looks so pretty as an everyday shade and again, so easy to blend out. The third shade is definitely a bright shade, it is a bright light cool toned pink which makes it a little too bright for my skin tone, but if you mix it with the second shade it looks stunning. The fourth and final shade on the bottom row is definitely the brightest and most pigmented shade in this palette, it is a bold dark pink shade with a satin finish whilst the other shades are completely matte. I don't tend to use this last shade that often because it is too bright for my skin tone and is a little hard to wear. Overall, I think that this is a fantastic palette that has a good mixture of tones, colours and finishes which is great for such a budget friendly palette. I haven't tried any other of the blush palettes from Makeup Revolution before but so far I am loving them. The blushes are so easily to blend out and very pigmented and the highlighters are stunning and easy to build up or wear sheerly. This palette retails for just £6, thats less than a 75p for each shade such a bargain! You can pick this up from Makeup Revolution's website here, or from Superdrug here. What is your favourite Makeup Revolution product?